In the early 1970’s, so the story goes a group of young up and coming Portuguese script writers recruited from adverts in trade magazines and on university noticeboards were locked in a room together with a projector, an endless supply of coffee and cigarettes and a pile of books. The books were mainly short story collections of the weird and esoteric fiction variety whilst the projector showed episodes of American sci-fi/supernatural TV show The Twilight Zone in continuous rotation. This inexperienced collective were charged with producing the first six episodes of what was hoped to be Portugal’s response to a current trend for surreal storytelling and macabre tales. Given the work that Spanish filmmaker Amando de Ossorio and Italians Jess Franco and Dario Argento were currently involved with it is easy to see why television executives thought there was an opening in the market for Portugal’s take on the genre. The dream was to create a weekly TV show much like The Twilight Zone but with European art house sensibilities that showed leanings towards the current trend for the more grisly macabre work of those three directors. This claustrophobic setting and the darkly intense atmosphere of the continuously flickering projector led this band of writers to emerge almost two days later with the now fabled ‘O Campo Bazar’. Critics were relentless in their damning of everything to do with this project from the sets and stories to the acting and directing. There was however one factor that caused such embarrassment that it is often cited as the last nail in the not very convincing coffin. To affiliate this fledgling series to an already established genre and gain credibility, Vince Price had been employed to provide the voiceover introduction. It transpired that a staggeringly significant percentage of the overall budget had been spent on securing Price’s services – money that everyone agreed should have been spent on the program itself. What made this so embarrassing however was the fact that Vince Price’s pronunciation and overall delivery of the Portuguese introduction was so cringingly bad as to sound like a mocking stereotype. With no money left to find another actor of Price’s stature to rerecord the part, and with newspapers and radio programs daily mocking this particular aspect of the show, the station programmers decided to cut their losses and pull the plug. ‘O Campo Bazar’ would have disappeared without a trace – as was the TV Company’s wishes – had it not been for the release of the` (episodios de) O Campo Bazar’ e.p. Indeed there are no known surviving prints of the six episodes – of which only four ever saw the light of day – but the existence of this e.p. has ensured that the legacy of this doomed project is not forgotten. 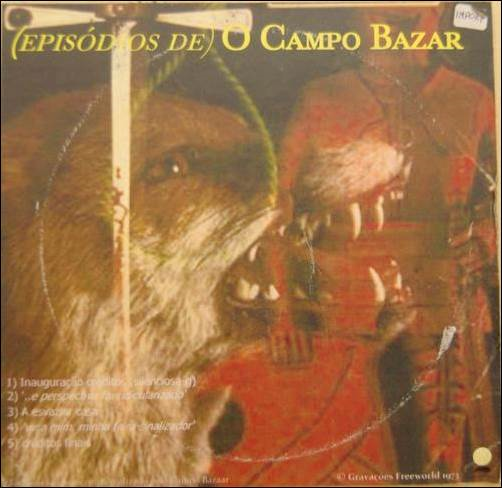 ` (episodios de) O Campo Bazar’ was a promotional gimmick marketed as `a sampler of instrumental works created especially for the programme’ and has since become an ultra-rare curio hiding out with the national collection of Hen’s Teeth. The original press release states that `the stunning full colour sleeve features O Campo Bazar in horrifically realistic costumes’. This is the only reference ever given to the performers who were – and still are – a mystery. Released in Portugal in 1973 on the Gravacoes Freeworld label this collection of sinister synth led soundscapes is long overdue a rerelease. Several years later the cult status and mythos of the group/artist brought about the release of `The Bane Tree’– again on the Gravacoes Freeworld label. 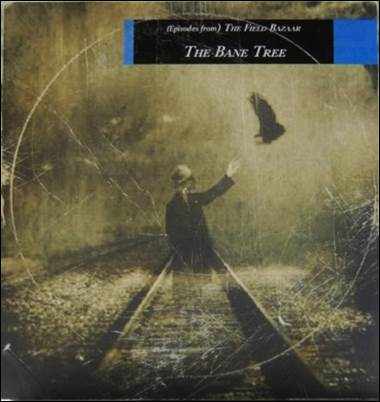 This vinyl version of `The Bane Tree’ is the only UK release for `O Campo Bazar’ there has been the. The artist(s) name had been translated into English – The Field Bazaar – and the` (episodes from)’, which was a clear indication of its TV series roots, had also been translated and kept. The name itself – `The Field Bazaar’ – comes from a short story by Sir Arthur Conan Doyle and was seemingly chosen to represent the writers own take on `The Twilight Zone’…..a mysterious place where the weird and wonderful coexist with the horrifying and the macabre. 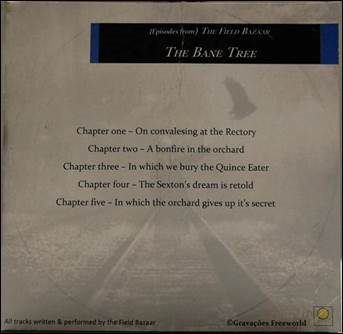 The Bane Tree has the feel of being demos and unused tracks from the original recordings although the music is more acoustic and pastoral sounding with greater use having been made of sound effects. The performers remained unknown. Recently artwork for a previously unreleased and assumed lost (episodes from) The Field Bazaar album `A Tale of Witches, Woodland and half-remember melodies…’ was discovered in a box of old picture frames at a church jumble sale in Long Crendon, Buckinghamshire. In 2012 a ¼ inch tape also surfaced at a bankruptcy sale for a small recording studio in Bloomsbury which had been known for soundtrack and sound effect recordings. This acetate contained what is now believed to be tracks from the recording sessions for this lost album. So far a tweaked and updated `The Musgrave Ritual’ is the only track to have materialized from this lost album. The title again references Sir Arthur Conan Doyle and includes a reading of the ancient ritual from the Sherlock Holmes story of the same name. 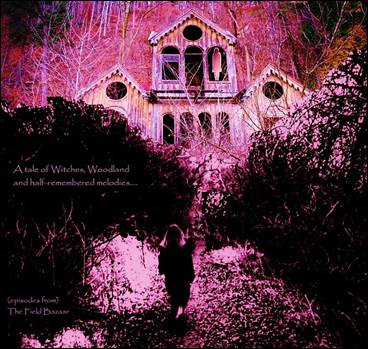 Also found alongside what is assumed to be the final approved artwork for the lost `A tale of Witches, Woodland and half-remembered melodies….’ was a scribbled early sketch for the album cover – possibly drawn up by one of the unknown, almost mythical members of the band/collective/composer who made up (episodes from) The Field Bazaar. A more recognizable sketch of the final composition shows the removal of the witch’s young companion for the image –possibly considered too sinister in its implications – and also the crucifix from the front of the building. The Long Crendon sketches – Note the inclusion of the child and crucifix in the first sketch which has been omitted in the second more familiar image. Unfortunately there are no signatures or notes on the reverse of either piece to hint at who the artist may have been or even who was operating in the studio under The Field Bazaar moniker at the time. Several tracks recorded by (episodes from) The Field Bazaar have been rereleased in recent years thanks to the work of a small group of geekish fans who hunt down the original studio versions, strip them down, clean them up and remix them to form even the briefest of tunes into a coherent track. Their curation and conservation of the (episodes from) The Field Bazaar’s music is not only helping to save a forgotten gem but also to bring it to a wider audience. Next postFree Shipping on FHR books (April).